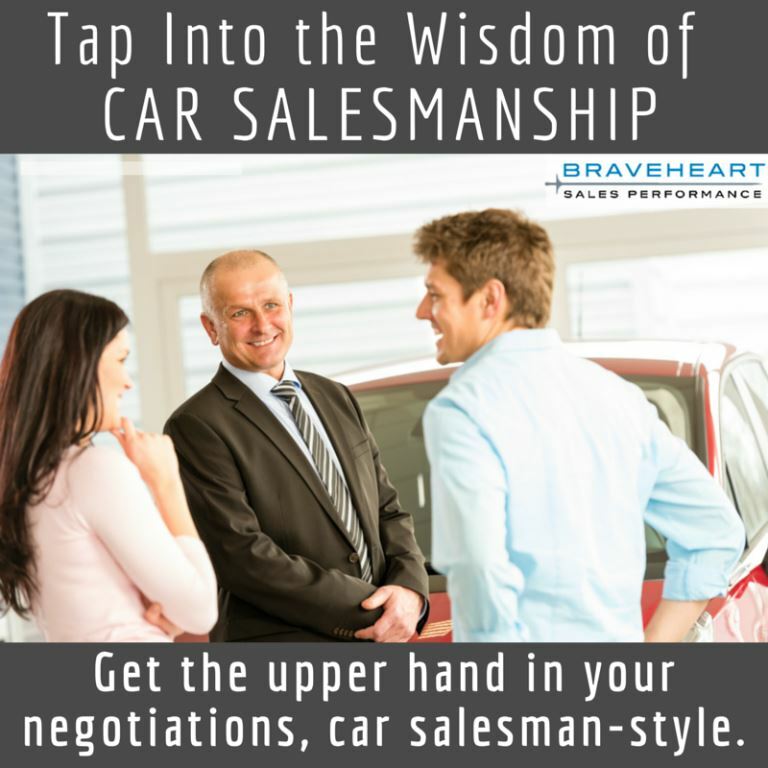 Should Your Salespeople Sell The Way Car Salespeople Do? I am just concluding the process of leasing another new car. Even though I study and teach selling and negotiating techniques, I don’t like the process any more than most people do. But I have approached this particular experience as a student of their process and I believe I have observed some things that may help other sales teams. It is clear to me that the reason most of us don’t like the process is that we seldom have all the facts. The car dealer has much more information about the situation than we do and therefore they carry more power in a negotiation. 1. The buyer is typically more emotional about the product than the salesperson. Everything about the way cars are sold is focused on getting the buyer to fall in love with the vehicle. They get us to see ourselves in the car, literally they do, by offering us test drives. How can we apply those principles to our selling situations? Can we do a better job of tapping into the emotion of the buyer? If they don’t buy our product or service which solves their problem will it make them look bad inside their company? And even though much of the car buying process is dreadful, we quickly forget after we have our shiny new vehicle. 2. The car dealer always knows more about the financial playing field than we do as buyers. Especially when one leases a car, the variables are not always known to the buyer. Even when I asked for all the components of the lease transaction days in advance of the date of delivery, they still conveniently left pieces out, until I continued to demand all the facts. Then they complied, because I told them I would walk away if they did not. I don’t typically like to threaten but I spoke their language. I made them believe that I didn’t need the car, which I didn’t. Then and only then did they show their hand. They actually did want or need to move that car. Could your sales team be bolder in figuring out the financial situation of the buyer? For instance, what is the financial impact of not solving their problem through purchasing our products or services? If your salespeople cannot figure out the ins and outs of their buyer’s financial situation, then work with them to get comfortable really talking about money and finances. Make sure they can calculate the ROI of your services and the negative financial impact to the buyer of not having your services. It is hysterical to me that if you tell the car dealer what you are paying now in monthly payment the payment they quote is miraculously close either cents higher or lower than what you pay now. They focus in on the buyer’s financial situation like a laser. 3. Then comes the decision-making process. Car dealers are masters at a negotiation technique where the individual you are dealing with does not have any authority to quote you anything. Frequently they don’t even know the first thing about how the financing actually works. This may be the most annoying part of buying a car because your contact always has to go get whatever you want approved by someone else. They really don’t have any authority to do anything. The car dealer uses it to their favor because going and getting something changed always requires a lot of time. It is never just a quick 60 seconds to check. They come back with something less than satisfactory and then see if you will bite because they know that you are weighing in your mind whether you will just accept their position or continue to wait while they traipse back to try and get another concession. To be clear, I am in no way suggesting you put your customers through this same horrible process. I am suggesting that maybe we need to help our salespeople out in the negotiation by stripping some of their authority. If they can’t make all the decisions then we are helping them remain unemotional. They can’t get sucked in by the negotiating tactics of the buyer. They can become better fact finders, like car salespeople are, to get enough information to take to you so that you can make a decision. Or maybe you just teach them that it is okay to take a time out if they are feeling pressured into something. Give them the authority to say “I can’t make that decision on my own. I need to get back to you.” This will enable them to keep a calm head and will save them from themselves, and the potential to get backed into a corner. These three steps: Understanding your buyers’ emotional impact, understanding the financial impact and managing the decision-making process are the three cornerstones of the qualifying process. While I hate buying cars, I somewhat admire the way the car dealerships go about understanding these three elements. I mostly dislike the process because of the deceitful nature in which the strategies are employed; by conveniently leaving information out, by acting like it was just a misunderstanding or by not being forthcoming with the true financial information about the purchase. I would never suggest that it makes good long-term sense to employ the tactics that a car dealer employs…however you gotta love their mastery of these three steps. Take pieces and parts of their annoying process and help your salespeople improve their bravery in fully qualifying and negotiating transactions. Let us know how it goes. This article was syndicated from Business 2 Community: Should Your Salespeople Sell The Way Car Salespeople Do?